Introducing diffuse natural daylighting into a retail space has proven to increase sales and productivity. Full spectrum, glare-free daylight encourages consumers to spend more time shopping by creating a better mood and allowing products to be seen in sharper detail. The bottom line benefit extends to any commercial building: From reducing energy costs to increasing employee production, a space enhanced by diffuse natural daylighting increases in value per square foot. Here are five retail/commercial projects across the globe where Kalwall translucent sandwich panels have been used to provide a diffuse natural daylighting solution. The brewery earned LEED Platinum level recognition for its sustainability and energy efficient design that also blends into the amazing country side. The design by Perkins + Will Architects allows full and efficient use of natural diffuse daylighting while reducing disorienting glare for both visitors and employees. 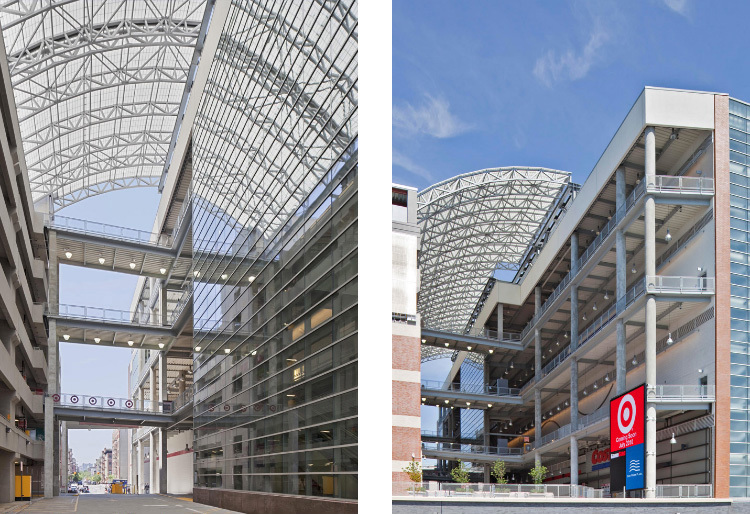 Translucent panels turned what would otherwise be a shadowed walkway between the parking garage and facility into a beautiful canopy that aids with transitioning pedestrian traffic into the retail space. Kalwall specializes in the use of natural lighting to reduce contrast ratios within transitional areas. Kalwall’s translucent sandwich panels encase the entrance way and main lobby of this modern day shooting range, bathing the interior with natural daylight. The illumination effect on the exterior offers visitors a welcoming glow seen from afar, beckoning customers to enter and experience the facility first hand. The seven story facility, Audi’s largest dealership, has three floors dedicated to a grand show room display. The international architectural practice of WilkinsonEyre used incorporated a backdrop of Kalwall translucent sandwich panels to fill the showroom with diffuse natural light, reducing glare and allowing for increased visibility. Kalwall curtainwall effectively allows for the use of natural daylighting in the upper conference rooms, sales area and 32-bay workshop. Heathrow Terminal 4’s international departure lounge underwent a massive renovation, replacing 1980’s glass rooflights with 1,750 meters of Kalwall translucent sandwich paneling. The newly-installed Kalwall roofing offers more privacy, while optimizing natural glare-free daylight.